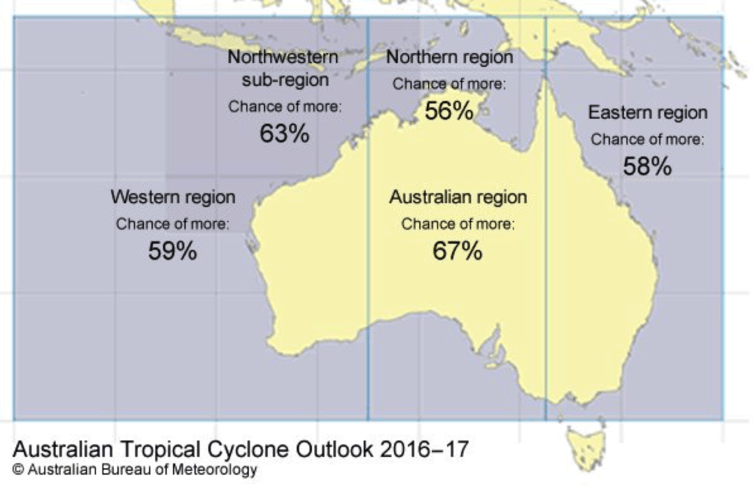 Northern Australia is likely to experience an average or above-average number of tropical cyclones this summer, according to the Bureau’s annual Tropical Cyclone Season Outlook, issued last week. Given current climate drivers, that means we’re likely to see 11 or more tropical cyclones in the Australian region, and typically around four of those will cross the coastline. The season will almost certainly be more active than the last. And that means it’s time to prepare, because the likelihood of damage from a tropical cyclone is high in any season. Last year was certainly nothing like a normal season, so you don’t want to be caught out. The Australian region saw only three tropical cyclones in total (easily beating the old record minimum of five set in the El Niño years of 1987 and 2006 from our data back to 1969-70), none reached severe status (Category 3 or above; this has never occurred) and only one crossed the coast (the equal lowest number on record). But why do we expect such a different season this time around? When a cyclone develops, the Bureau issues short-term weather forecasts on the cyclone’s likely track and strength. But for the tropical cyclone season as a whole, we can only look at the chances of more or less cyclones than average forming in Australian waters because cyclones and their tracks are so sensitive to subtle and fine-scale changes in the atmosphere and ocean. When considering how many tropical cyclones may form over a season, we currently use a statistical model that considers the long-term relationship between cyclones and the state of El Niño or La Niña (properly known as El Niño–Southern Oscillation or ENSO). This particularly focuses on ocean temperatures and atmospheric circulation over the tropical Pacific Ocean. The model uses the Southern Hemisphere Best Track Cyclone database. This historical record extends back to 1969 and is jointly-maintained by the Bureau, Météo France (La Reunion), Fiji Meteorological Service and Meteorological Service of New Zealand. These four agencies are assigned by the World Meteorological Organization to issue cyclone forecasts in the southern hemisphere. Typically Australia sees around 11 tropical cyclones in a season: four in the eastern region (with one crossing the coast), three in the northern region (with two crossing the coast), seven in the western region (with two crossing the coast) and five in the northwestern region. Tropical cyclones form in regions with very warm surface waters — generally greater than 26 °C. The location of this warm water in the tropical Pacific Ocean and around Australia’s northern coast is affected by ENSO. During El Niño years the warmest water in the tropics (and associated tropical weather) tends to be located away from Australia, in the eastern tropical South Pacific. In La Niña years, this warm water tends to be located in Coral Sea, between Australia and the Solomon Islands. Plots of observed cyclone density in the southern hemisphere with ENSO phase. The observed density of cyclones during La Niña years is subtracted from the observed density during El Niño years. The image above shows that during El Niño years, cyclones are more likely to occur away from Australia, closer to the dateline and in the eastern south Pacific, as well as in the western Indian Ocean. This is why 2015 - which was also one of the strongest El Niño events on record, arguably behind only 1982–83 and 1997–98 - resulted in such a quiet tropical cyclone season for Australia. It is also why the eastern Pacific at the same time experienced its second most active (eastern) Pacific Hurricane season on record. Conversely, during La Niña years, cyclones are more likely to form in the western Pacific/Coral Sea, and in the eastern Indian Ocean. As La Niña also tends to bring warmer-than-average waters around Australia’s coastline, the Australian region experiences more cyclones overall. Of course ocean temperatures are just one factor that drives the formation of cyclones. Changes in the atmosphere also encourage tropical cyclones, including higher humidity and more favourable winds. Because tropical cyclones form closer to the coast during La Niña years, and there tends to be more winds guiding them towards land in some areas, there is a greater chance of more cyclones making landfall. The first crossing also typically comes earlier. History shows that, on average, the first tropical cyclone to make landfall during a La Niña year is around December 10, more than two weeks earlier than the average date across all cyclone seasons; December 25. Typically, Australia’s western coastline sees the first crossing of the year. The record number of tropical cyclones to cross the coast occurred in the La Niña season of 1970–71, when eight crossed the Australian coastline. The most cyclones on record for an Australian season were in the La Niña summer of 1973–74 and the neutral 1983–84, when 18 tropical cyclones formed. This highlights why a benign season like 2015–16 should not make us complacent. As this season starts, ENSO is neutral. But a La Niña 'WATCH' is current, meaning a La Niña certainly cannot be ruled out before the end of the year. The latest observations show the Pacific Ocean has several indicators that have exceeded La Niña thresholds. El Niño and La Niña develop slowly, and likewise their impacts don’t appear suddenly. With warmer water around Australia’s northern coastline – a classic La Niña-like pattern – the odds rise of an above-average tropical cyclone season.